See if you can land a caption or two. Our winner will touch down Saturday. Another satisfied customer at Boom Boom's Driving School. Dude, my car is da BOMB!! "Hey Officer dude. I see what your problem is. Your leaking oil!" 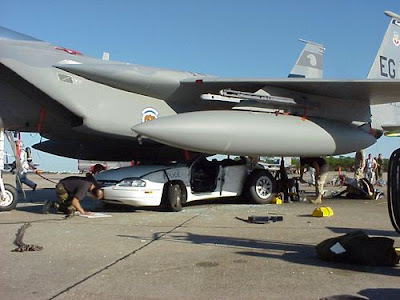 Military intelligence had to finally concede that the piggybacking technique for the F-15 was frugally impractical. My mind is drawing a huge blank today. Actually that is pretty much situation normal Quirky. Maybe I'll try later after a dozen or so DDPs! ha! I can't think of anything! Dammit. However, I loved skeeter's comment - "Pimp My Ride", military edition"
My old man is a television repairman, he's got this ultimate set of tools. I can fix it. Officer Dibble finally snaps when forced to meet his quota for speeding violations. And that was the incident that had the military adopt a pro-rated flying licensing system. The pit crew quickly sees that two new tires will not get the car back in the race. The U.S. Government shut down today forcing the military to extreme cuts. Atlas Driving School For The Blind!